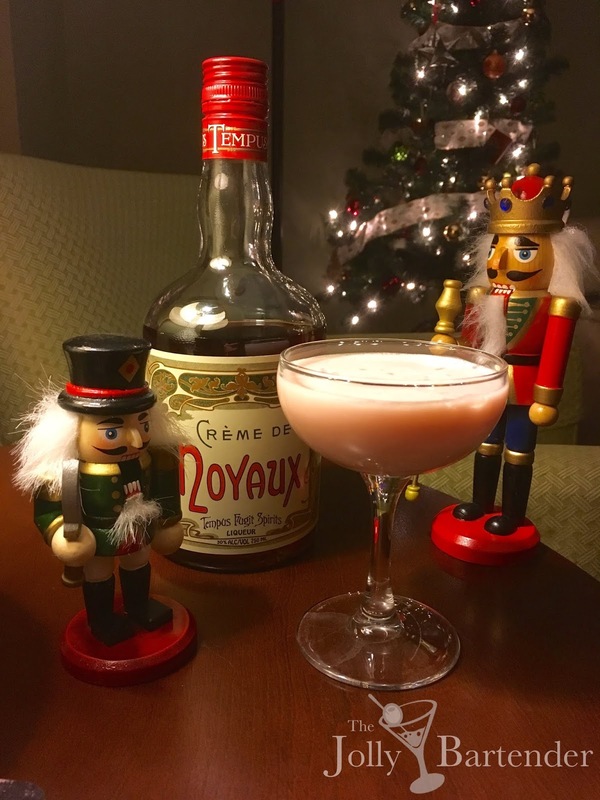 Creme de Noyaux is an important part of making the Nutcracker nutty. It is made with almonds, stone fruit pits, and herbs and is more bitter than amaretto. I am using Tempus Fugit's excellent Creme de Noyaux, which is great to sip by itself--something you can't say about those bargain cremes. The other ingredient the recipe calls for is coconut amaretto. I'm not sure that this spirit ever existed, or if it did, it was a limited run. My guess is that the New York Bartender's Guide includes this drink as a way to showcase liquors that existed at some time in the past, but I doubt that you'll find a commercially available coconut amaretto now. So to make it I used cream of coconut, vodka and amaretto. (Note: I really only made enough coconut amaretto for one cocktail, but the basic process and proportions should hold true for a larger batch if you wish to make it.) I especially liked how this homemade spirit was reminiscent of amaretto but with a cloudy white color and coconut sweetness. Put one part coconut cream in a jar and add an equal part of vodka to it. Add several dashes of amaretto to the mixture, seal the jar and shake it until the coconut is suspended. Store it in the refrigerator for a few hours and the thicker, white and fatty parts of the coconut will float to the surface, leaving a cloudy coconut vodka underneath. Skim off the white coconut fat and you have a coconut amaretto underneath! The cocktail itself is much simpler to make.